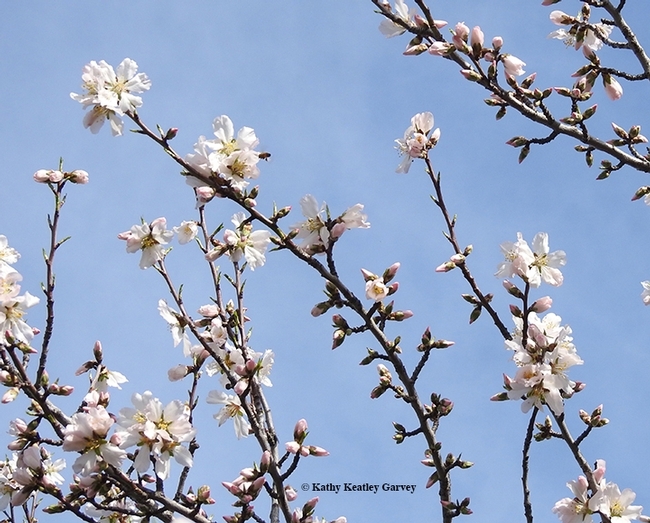 It's almond pollination season in California but the weather refuses to cooperate. Heavy rains, high winds, intense flooding. What are the bees to do? They're holed up in their hives, waiting for the sun breaks. When the rain stops pelting their hives and the temperature climbs to 50 or 55 degrees, they poke their heads out. Let's go, girls! Such was the scenario today when we went for a drive along Pleasants Valley Road in Vacaville, Solano County. Feral almond trees, storm-battered but stubbornly bracing for more, are blooming, and those bees--those glorious bees--are back. The statistics are a bit overwhelming. California now has one million commercial acres of almonds. It takes two colonies per acre to pollinate them. Without bees, no almonds. With beekeepers reporting winter losses of 40 to 60 percent, what's the situation? 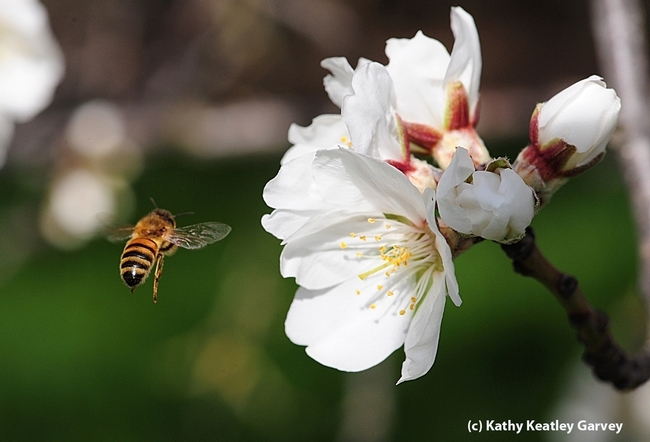 "What does that mean for the bee supply for almond pollination?" 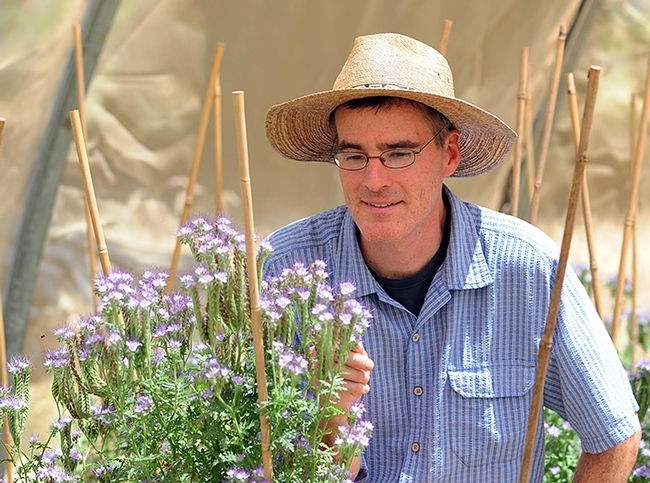 asks pollination guru Gordon Wardell in the current edition of Project Apis m (PAm). The organization's name comes from Apis mellifera, the scientific name for the European honey bee. "At present, while individual beekeepers' numbers appear to be down, there doesn't appear to be a shortage of colonies for almond pollination this year. While the supply might be tight, I don't foresee major shortages. Rental prices are up this year, averaging $170 to $185 per colony. This is $10 to $15 over rental prices last year. These prices are fair increases considering the amount of feeding needed to ready the colonies for February pollination and the increases in transportation costs." 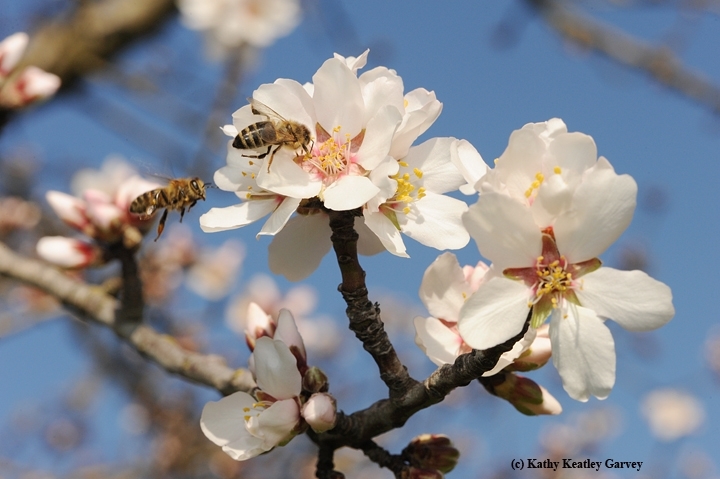 Wardell, chair of PAm's board of directors and the 2016 recipient of the California State Beekeepers' Association's Distinguished Service Award, knows bees, knows almonds, and knows pollination. A professional apiculturist for more than three decades and now director of pollination operations for Wonderful Orchards, he's a former Extension apiculturist for the state of Maryland. His research includes developing Mega-Bee, the honey bee nutritional supplement. He's authored numerous publications on honey bees. His expertise covers Varroa mite control, honey bee nutrition, fire ant monitoring, small hive beetle, Africanized honey bees, and many other topics. Wardell describes what's happening in California now as "the greatest commercial pollination event in the world." Because it is. Billions of bees pollinating a million acres of almonds. On a minuscule scale, it's still marvelous to see a dozen bees foraging on a single feral almond tree...doing what bees do. 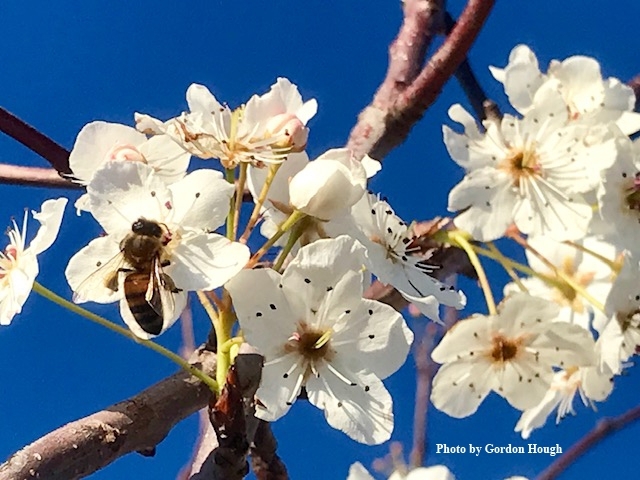 So you want to learn more about almond pollination, integrated crop pollination, blue orchard bees, navel orangeworms, wildflower plantings and solarization for wildflpwer planting success. You're in luck. Two almond field days-- one set Thursday, March 10 in Lost Hills, Kern County, and the other on Tuesday, March 15 in Zamora, Yolo County--are scheduled and you're invited. 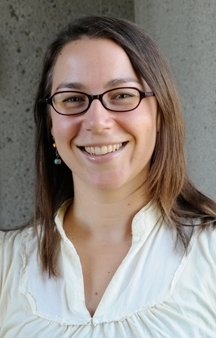 They're free to all interested persons and no reservations are required, says coordinator Katharina Ullmann, crop pollination specialist for the Xerces Society for Invertebrate Conservation who holds a doctorate in entomology (Neal Williams lab) from UC Davis. UC Davis pollination ecologists and other experts will be among those speaking. 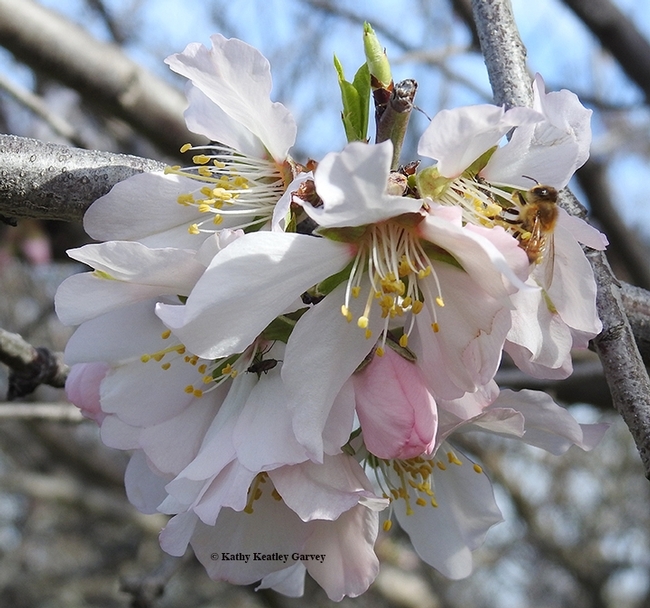 For the March 10th event, titled “Almond Field Day: Integrated Crop Pollination,” participants will meet from 9 to 11 a.m. in an orchard east of Highway 33, about 5.8 miles north of the intersection between Highway 37 and Highway 36, Ullmann said. Signs will guide the way. 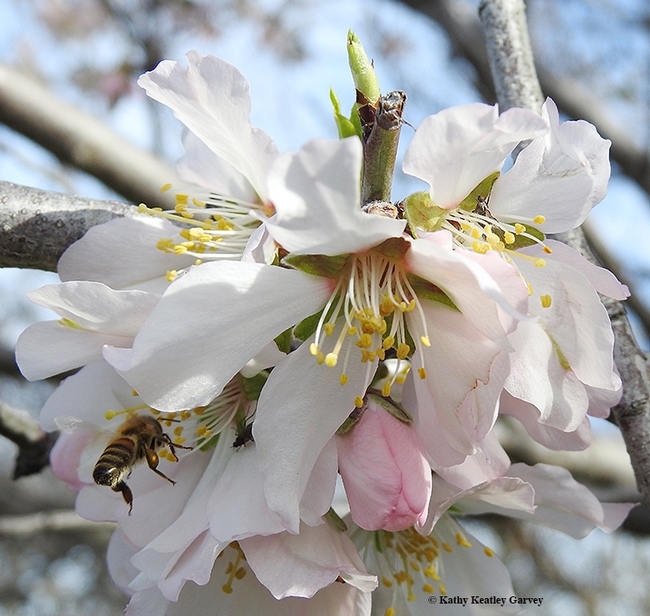 “This field day will provide an overview of integrated crop pollination for almonds,” Ullmann said. Topics will include almond pollination, minimizing risks to pollinators during bloom, and research updates on blue orchard bees and wildflower plantings for almond pollination in Kern County. The field day will include a tour of an orchard integrating honey bees, blue orchard bees, and wildflower plantings. Sponsors are the UC Agriculture and Natural Resources, UC Davis, Integrated Crop Pollination Project, Xerces Society for Invertebrate Conservation, Wonderful Orchards, and USDA's NRCS. For the March 15th event, titled “Almond Pollination and Orchard Pollinator Planters,” all interested persons will gather from 9 a.m. to 11 a.m. at 8304 County Road 91B, Zamora. 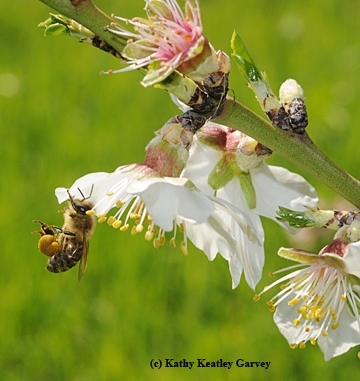 “This field day will provide an overview of integrated crop pollination and on-farm wildflower plantings for almonds in the Sacramento Valley,” Ullmann said. “We will hear the latest research from a UC Davis lab studying almond pollination and wildflower plantings, learn about almond pollinators and how to support those pollinators using wildflowers. We will also discuss establishment and maintenance practices for planting habitat on field crop edges and provide an overview of plant species appropriate for plantings in the Sacramento Valley and beyond. Two growers will share their perspectives. The sponsors include UC Agriculture and Natural Resources, UC Davis, Xercies Society, Integrated Crop Pollination Project Colusa County Resource Conservation District, and the Yolo County Resource Conservation District. Continuing Education Credit (CEC) will be given. 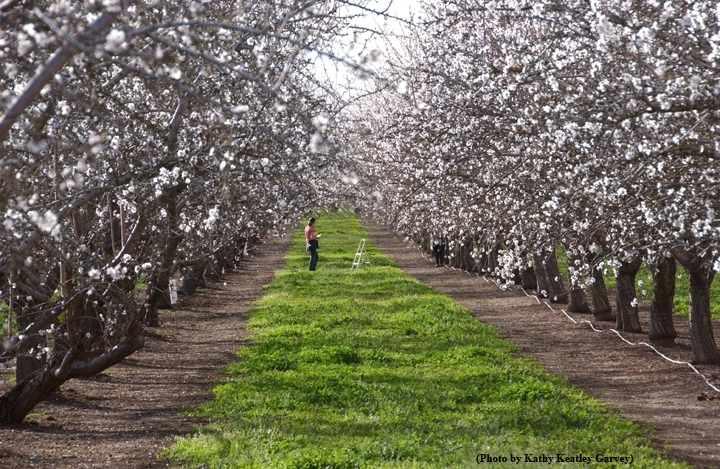 Participants at the almond field days are asked to bring a hat, sunscreen and good walking shoes. For more information contact Katharina Ullmann at katharina@xerces.org or at (530) 302-5504. She's the beekeeper/graduate student at Harvard's Graduate School of Design who traveled through almond orchards in California's Sacramento and San Joaquin valleys in May 2014 to illustrate and pen a book about the spatial relationship between honey bees and almonds. We wrote about her in a Feb. 11th Bug Squad blog. The book, "Almond and the Bee," is now a reality. See http://blur.by/1CmYr3h. She's offering the book at cost ($9) and donating about $2 from the sale of each book to benefit the bees. The benefactor will be either the Xerces Society or Project Apis m.
Stephanie, a master of landscape architecture candidate who keeps bees on the rooftop of her school building, shared her marvelous 46-page digital story, http://almondandbee.com, with us earlier this year. 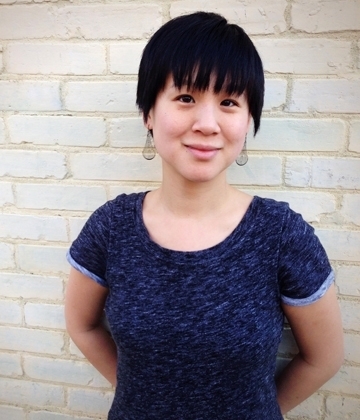 "I was inspired to create socially engaging and ecological performative places and hope to bring my passion for enhancing natural systems to the urban environment," she told us. "As a designer, I developed an interest in pollination during my second semester at the Harvard Graduate School of Design--I used the idea of pollination to attract people and pollinators to a park redesign, and developed a planting palette and a promenade that would do so." Stephanie received a grant to finance her project. She spent a week in "almond country," meeting with experts at UC Berkeley and UC Davis, the Almond Board, the Blue Diamond Cooperative, beekeepers, almond growers, and almond growers/beekeepers. Pollination ecologist Neal Williams, associate professor, UC Davis Department of Entomology and Nematology, was among those who sat down with her and talked almonds and bees. He filled her on his research and offered tips on people to meet and places to see. "The shape of the project developed during my fall 2014 semester," she related. "I thought an illustrated story would allow me to combine my photographs, maps, and drawings, with found historical images in an engaging and accessible form...The story is about how that came to be, but it's also an argument for holistic thinking in agriculture that could be both cultural and economically significant." Two key sentences on the first page of http://almondandbee.com beckon the reader: "The almond and the bee. The spatial relationship of the orchard, bee, and dwelling through time." Almonds and bees need each other, she points out. California has more than 900,000 acres of almonds, and each acre requires two colonies for pollination. And every year some 1.6 million colonies, or approximately 60 percent of the nation's colonies, are trucked to California. "The relationship between almond growers and migratory beekeepers are in many ways analogous to that of the fruit tree and the bee—one is sedentary and one is mobile, but both depend on one another," Stephanie writes. In her book, she traces the modern history of the honey bee, touches on traditional beekeeping methods, mentions the invention of the Langsroth hive in 1851, and takes a peek at the future of beekeeping and almond orchards. In February 2015 we described it as "an informative, creative and well-designed (digital) story." Now it's March 2015 and it's 'an informative, creative and well-designed book," with proceeds aimed at helping our troubled honey bees. The word is "bees" and "almonds" are their world. Right this very minute there are about 1.7 million colonies of bees pollinating California almonds. Since it takes two colonies to pollinate one acre, and California doesn't have that many bees, beekeepers throughout the nation trucked in some 1.6 million colonies. "Spend a couple days driving on county roads around I5 and Hwy 99 in the Central Valley of California, and you can feel the excitement!" writes Christi Heintz, executive director of Project Apis m. in her February newsletter. "Semi-load trucks are delivering over 400 hives each near orchards." Some lucky bees have been able to forage on PAm's Mustard Mix and thus will not starve prior to bloom! As Heintz explains: Project Apis m.'s mission is to fund and direct research to enhance the health and vitality of honey bee colonies while improving crop production. Our organization's name comes from Apis mellifera, the scientific name for the European honey bee. Project Apis m. or PAm is the go-to organization at the interface of honeybees and pollinated crops. We've infused over 2.5 million into bee research since our inception in 2006 to provide growers with healthier bees resulting in better pollination and increased crop yields. We have personal relationships with the nation's commercial beekeepers and with the top bee scientists in the country." "We fund research studies, purchase equipment for bee labs at our universities, support graduate students and provide scholarships to young bee scientists to encourage their pursuit of science-based solutions to honey bee challenges." "We are a non-profit 501 (c) (5) organization governed by an eight-member board. Our board members are beekeepers representing the major national and state beekeeping organizations. Four scientific advisors review research proposals and provide recommendations to the board." (Among the long-term advisors: Extension apiculturist (now emeritus) Eric Mussen of the UC Davis Department of Entomology and Nematology.)" Unfortunately, California is deep in the throes of a four-year drought. 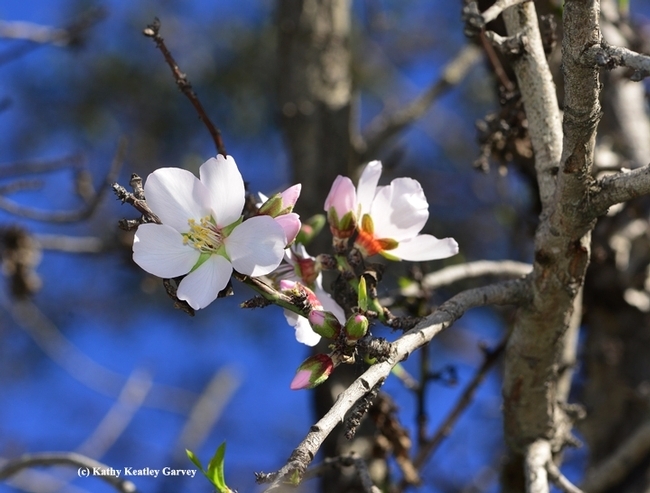 As Heintz notes in her current newsletter: "Last year, we sadly reported that the drought had prevented or delayed emergence of much of our pre-almond bloom flowering plants. This year, though the drought continues, we can happily report we are on target in many areas, with some rain falling at the right time so bees are enjoying planted forage during the usual pre-almond dearth." Meanwhile, explore the Project Apis m. website: lots of information about what this organization is doing and what it hopes to do.